Ocean Creek Resort will take you breath away the minute you lay eyes on the opulent 75 acre resort. 400 enchanting units offer a wide variety of choices, guaranteeing you will find just the right place whether it’s a vacation hideaway, permanent residence, or a rental property you are looking for. Vacationers and residents alike appreciate the security afforded by the gated entrance to this stunning resort. Choices, Choices, Choices! Your biggest problem at Ocean Creek Resort will be choosing the right unit for you. Maybe you’ll pick The Oceanfront Towers, offering 2-3 bedroom condos in two 15 story beachfront towers. 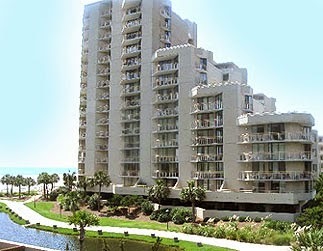 These waterfront condos are adjacent to the pools and the Beach Club with panoramic views of the salt water creek. Units are equipped with wet bars, top of the line appliances, European cabinetry and more. Perhaps you would prefer something a little more exclusive like the 2-3 bedroom units of The Garden Homes which are attached but separate and set in a serene wooded environment. These homes feature a stunning entry courtyard, vaulted ceilings, tile flooring, and private patios, just for starters. Golfers will appreciate the spacious 2-3 bedroom, split-level town-houses of The Greens, where the front lawn is actually a putting green and an exquisite pool and deck grace the back yard. If tennis is your thing, you’ll love The Tennis Villas with 1-2-3 bedroom homes adjoining the resort’s pool and tennis facilities and featuring a private entrance, screened in porch and more. The finest in vacation property, The Lodge Villas offer 1-2 bedroom condos. 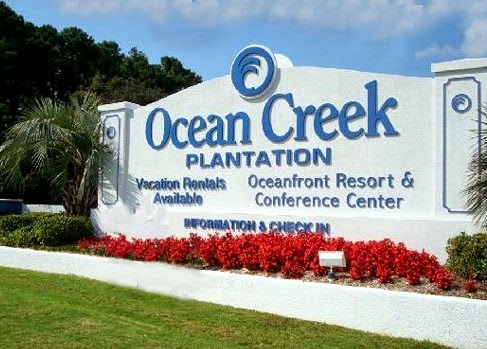 There are so many amenities at Ocean Creek Resort you may never leave the property! 24 hour security with a gated entrance, 24 hour front desk/concierge service, fitness center, game room, playground, 6 outdoor pools, indoor pool and Jacuzzi, convention center/banquet facilities, tennis courts, golf packages and putting greens, fine dining and a convenience store on-site, a beach bar and grill are just some of the perks that come with living at Ocean Creek Resort. If you are looking for a life of luxury, you have found it! Let us show you the homes for sale at Ocean Creek Resort. Call today!